With the short-lived Union of Serbia and Montenegro declared defunct by both republics in June 2006, the two, remnants of the ex-communist Yugoslav federation, are going it alone as separate and sovereign republics. 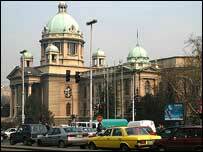 Brokered by the EU, the Union of Serbia and Montenegro was born in 2003. The aim was to settle Montenegrin independence demands and stabilise Balkan borders. The union deal also contained the seeds of its dissolution. It said that after three years the two republics could hold referendums on whether to keep or scrap it. When Montenegro held an independence referendum in May 2006, just over the required 55% of voters opted for separation from Serbia. The Montenegrins followed up soon afterwards with a declaration of independence and Serbia accepted the inevitable, declaring itself a sovereign state and the successor to the Union of Serbia and Montenegro. The process of fully disentangling the two will involve careful negotiations. The Socialist Republic of Yugoslavia, consisting of Serbia, Montenegro, Slovenia, Croatia, Bosnia-Hercegovina and Macedonia, was proclaimed in 1945. Under authoritarian communist leader Josip Broz Tito the lid was kept on ethnic tensions. The federation lasted for over 10 years after his death in 1980 but under Serbian nationalist leader Slobodan Milosevic it fell apart in bloodshed through the 1990s. The secession of Slovenia and Macedonia came relatively peacefully but there were devastating wars in Croatia and Bosnia. Serbia and Montenegro together formed the Federal Republic of Yugoslavia between 1992 and 2003. In 1998 violence flared in the autonomous province of Kosovo in Serbia. The Kosovo Liberation Army, supported by the majority ethnic Albanians, came out in open rebellion against Serbian rule. International pressure on President Milosevic grew amid the escalating violence. Nato launched air strikes in Kosovo and Serbia in March 1999. An exodus of ethnic Albanians to neighbouring countries gathered pace. The UN took over administration of the region after Serbian forces had been driven out. Today, Kosovo is de facto an international protectorate but legally is part of Serbia. Its status remains the subject of a bitter dispute between the Albanian majority, who seek independence, and the minority Serbs. It is a dispute in which Belgrade retains a keen interest. UN-sponsored talks on the future status of Kosovo got under way in November 2005. Montenegrin leaders, including current Prime Minister Djukanovic who was once a Milosevic ally, distanced themselves from the former Serbian leader's handling of Kosovo. After his downfall in October 2000 they were increasingly keen for independence. 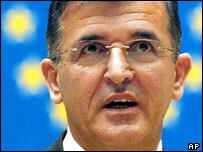 In late 2005, the EU began talks with Belgrade on the possibility of reaching a Stabilisation and Association Agreement. These were called off some months later because of the continuing failure of the Serbian authorities to capture war crimes suspects Ratko Mladic and Radovan Karadzic. The union parliament of Serbia and Montenegro chose Svetozar Marovic, a Montenegrin, as the country's first president in March 2003. He was the only candidate. Mr Marovic is deputy chairman of the Democratic Party of Socialists (DPS) led by pro-independence Montenegrin Prime Minister Djukanovic. He headed a council of ministers with responsibility for defence, foreign affairs, economic affairs and human rights. Mr Marovic, who was 48 when he became president, promised to build ties with the EU and international organisations. On election, he said he would work to improve living standards for everyone in Serbia and Montenegro. Where does Montenegro go after its vote for independence?